Do Hedge Funds Love Weatherford International plc (NYSE:WFT)? Is Weatherford International plc (NYSE:WFT) a good investment right now? We check hedge fund and billionaire investor sentiment before delving into hours of research. Hedge funds spend millions of dollars on Ivy League graduates, expert networks, and get tips from industry insiders. They sometimes fail miserably but historically their consensus stock picks outperformed the market after adjusting for known risk factors. Let’s check out the latest hedge fund action regarding Weatherford International plc (NYSE:WFT). How have hedgies been trading Weatherford International plc (NYSE:WFT)? Heading into the fourth quarter of 2018, a total of 21 of the hedge funds tracked by Insider Monkey were long this stock, a change of -19% from one quarter earlier. 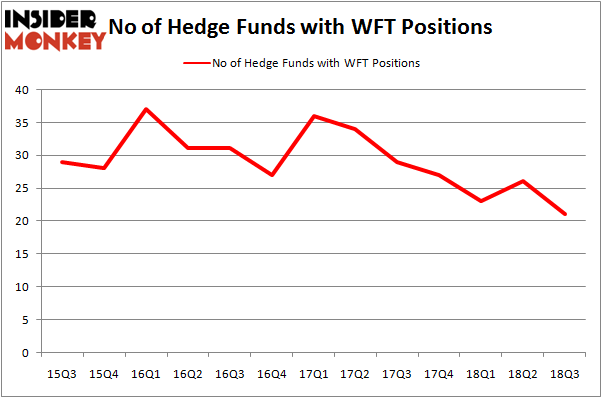 Below, you can check out the change in hedge fund sentiment towards WFT over the last 13 quarters. So, let’s check out which hedge funds were among the top holders of the stock and which hedge funds were making big moves. The largest stake in Weatherford International plc (NYSE:WFT) was held by Scopia Capital, which reported holding $84.1 million worth of stock at the end of September. It was followed by Perella Weinberg Partners with a $63 million position. Other investors bullish on the company included Millennium Management, Two Creeks Capital Management, and Nokota Management. Since Weatherford International plc (NYSE:WFT) has faced declining sentiment from the smart money, it’s easy to see that there were a few funds that slashed their full holdings in the third quarter. 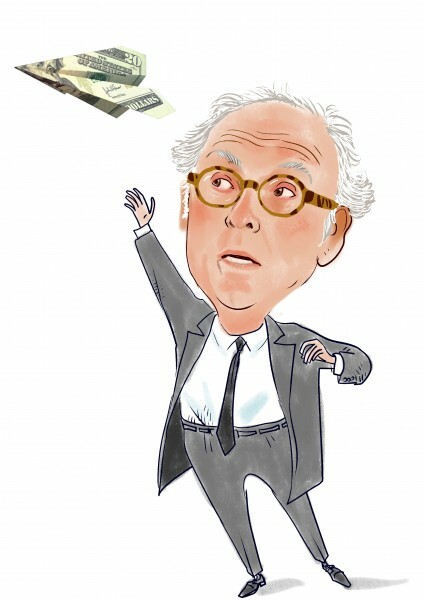 It’s worth mentioning that Anand Parekh’s Alyeska Investment Group cut the largest stake of the “upper crust” of funds watched by Insider Monkey, valued at about $27.1 million in call options, and Israel Englander’s Millennium Management was right behind this move, as the fund dumped about $8.2 million worth. These moves are important to note, as aggregate hedge fund interest was cut by 5 funds in the third quarter. Let’s check out hedge fund activity in other stocks – not necessarily in the same industry as Weatherford International plc (NYSE:WFT) but similarly valued. We will take a look at TreeHouse Foods Inc. (NYSE:THS), Triton International Limited (NYSE:TRTN), AeroVironment, Inc. (NASDAQ:AVAV), and Alliance Resource Partners, L.P. (NASDAQ:ARLP). All of these stocks’ market caps are similar to WFT’s market cap. As you can see these stocks had an average of 13 hedge funds with bullish positions and the average amount invested in these stocks was $114 million. That figure was $362 million in WFT’s case. TreeHouse Foods Inc. (NYSE:THS) is the most popular stock in this table. On the other hand Alliance Resource Partners, L.P. (NASDAQ:ARLP) is the least popular one with only 9 bullish hedge fund positions. Compared to these stocks Weatherford International plc (NYSE:WFT) is more popular among hedge funds. Considering that hedge funds are fond of this stock in relation to its market cap peers, it may be a good idea to analyze it in detail and potentially include it in your portfolio.